Cowboys and cowgirls are tough ranchers who work the land, protect the animals, and risking their livelihood every day under the sun. They are truly brave and strong people. Even stronger are those who capture dinosaurs and raise them on their ranch. You are such a person, a dino rancher, who has a mind to capture a few prehistoric animals. Good luck and be safe! Dino Dude Ranch, designed by Dan Letzring and published by Letiman Games, is comprised of 45 Food tokens, 52 Dinosaur tiles, 25 Tar Pit tiles, 1 Jurassic Hunter Grounds board, 5 Player boards, 7 Rancher Bonus cards, 44 Hired Hands cards, 2 Resource dice (custom six-sided die), and 1 Parts bag. The component quality is excellent. All boards and tiles are thick and durable, while the cards are are as thick as your standard playing card. Artists Derek Bacon, Michael Cofer, and Jesse Labbe provided colorful illustrations of the various dinosaurs in the game and the people who are trying to capture them, further strengthening the game’s theme and fun. To set up the game, first place the Jurassic Hunting Grounds board in the middle of the playing area. This board helps keep all the yet-to-be claimed game bits organized. Make certain all the players can easily reach it from their sitting positions. Second, shuffle the Hired Hands cards and place the deck face-down on the Jurassic Hunting Grounds board. A spot is reserved for the deck. This is the draw deck for the duration of the game. A spot for discarded cards is reserved next to the draw deck. Third, place all the Food tokens to one side of the Jurassic Hunting Grounds board. Food tokens represent leaves, fish, and meat. All the things dinosaurs like. Feel free to organize these by type or to keep them as one large grouping. Either way, this is the Food pool for the duration of the game. Fourth, place the Tar Pit tiles next to the Food pool and place all of the Dinosaur tiles into the Parts bag. Give the tiles in the parts bag a shuffle (mix the tiles in the bag) and randomly draw 4 Dinosaur tiles. Place these tiles, face-up, on the Jurassic Hunting Grounds board. An area is reserved for the tiles below the draw deck. Fifth, give each player 1 Player board and 1 randomly dealt Rancher Bonus card. The Player board is double-sided (night side and day side). Use the side that is appropriate based on the number of players in the game. All players should look at their Rancher Bonus card, but keep them hidden until the end of the game. Rancher Bonus cards will award the player additional points at the end if they do what the card suggests. Place any undealt Rancher Bonus cards and unused Player boards back in the game box. That’s it for game set up. Determine who will go first and begin. 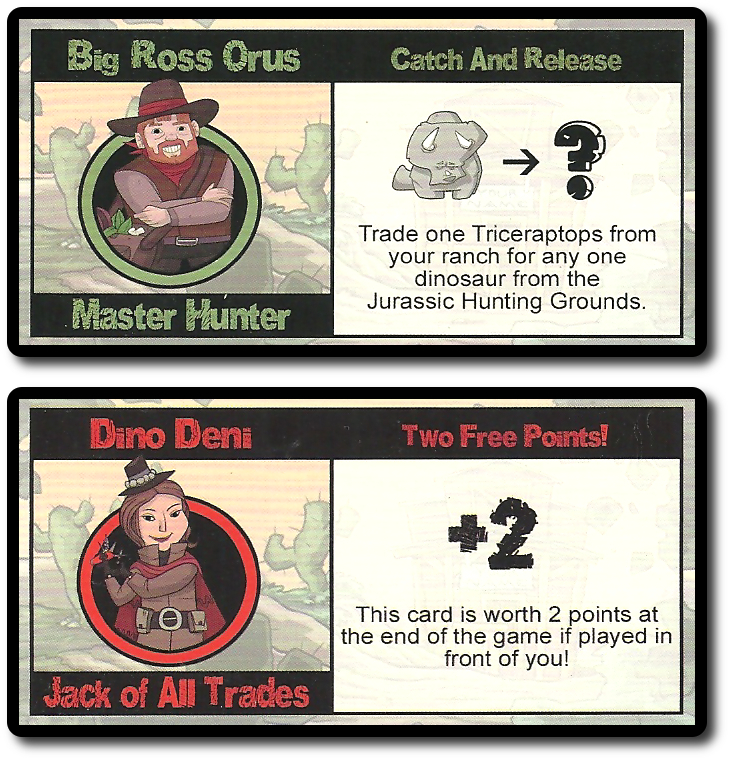 Dino Dude Ranch is played in turns with no set number of turns per game. A player’s turn is summarized here. There are two dice in the game. These dice will determine which Food resources the player will be given this turn. Some Food tokens are a bit more difficult to obtain, making them a less frequent value rolled. In addition, the dreaded Tar Pit tiles are also a possible value to roll, which create problems for the player, but a player could be gifted with an assistant, too. Based on the rolled values, the following occurs. There is no limit to how many Food tokens a player can have during the game, but they are a limited resource. If the player should roll a Food value that is not available in the Food pool, they may take the Food token from any opponent’s Food Supply. It should also be noted that a player’s Food Supply is visible to their opponents’ at all times. Hired Hand cards are given to the player for free if they roll them or they can be purchased later during the player’s turn. A Hired Hand will provide the player a beneficial effect or action that can be played during their turn or out of their turn (during an opponent’s turn). There is no limit to the number of Hired Hand cards a player can have in their hand, but there are a few restrictions for when they can be played. These restrictions, however, are pretty light, allowing players to use their Hired Hands with a great deal of freedom. The biggest restriction is that a player can only play 1 Hired Hand card during their turn and 1 Hired Hand out of turn. Most Hired Hand cards will be discarded when played. There are a few that will remain in play for the duration of the game. These are placed next to the Player board. Dinosaurs removed by Hired Hand cards are returned to the game box, not the Parts bag. Once the Hired Hand draw deck is depleted, it’s not reshuffled. Like dinosaur food, people brave (or foolish) enough to work with living dinosaurs are a limited resource. A player can take any of the following actions and in any order. The player can “capture” up to 2 Dinosaur tiles. The available dinosaurs are shown on the Jurassic Hunting Grounds board. The cost to capture the Dinosaur tile is the listed Food tokens on the tile. Note that some Dinosaur tiles have an image of another dinosaur. Yes, you guessed it. This means the player will have to discard a previously captured Dinosaur tile that matches the images in order to capture the new Dinosaur tile. Used Food tokens are placed back in the Food pool. Dinosaur tokens used are returned to the Parts bag. The newly acquired Dinosaur tile must be placed on the Player board using the empty squares space. The empty spot on the Jurassic Hunting Ground board is refilled by drawing 1 Dinosaur tile from the Parts bag. If 4 of the same Dinosaur tiles are ever visible on the Jurassic Hunting Ground board, remove them, place them back in the Parts bag, shuffle the Parts bag, and draw 4 new tiles. Normally, the player will only be able to purchase up to 2 Dinosaur tiles. However, if the player has a Hired Hand card that allows them to purchase more, they may play the card and continue to purchase Dinosaur tiles. A Hired Hand card can be purchased for any combination of 2 Food tokens. The card is drawn and added to the player’s hand. If the player earned a Hired Hand card due to their dice roll, they can still purchase up to 2 Hired Hand cards. Any Hired Hand card the player has in their hand, including those they purchased during their same turn, can be played. Only one per turn, however. This completes the player’s turn. The next player in turn order sequence now takes their turn. The game ends when all 52 Dinosaur tile have been captured (minus those removed from the game) or a player has filled their Player board, making it impossible to add anymore tiles. The game immediately ends and the players count their points. The Ranch Bonus card will only award points if the card’s conditions are met. 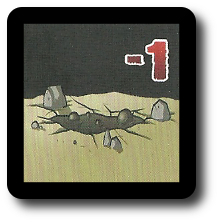 If the player managed to, they reveal their card now and collect the points. A number of game variants are provided for players to use if they want to spice things up a bit. Each variant is summarized here. Attack of the Tar Pits!!!! 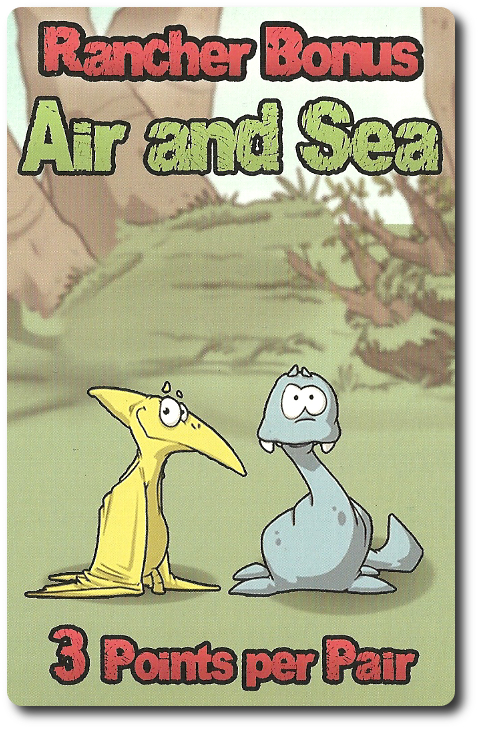 This game variant allows players to place a Tar Pit tile on their Player board or an opponent’s Player board. The means to acquire a Tar Pit (dice or cards) remains the same. Using these rules, the game becomes a bit more aggressive, but it also allows the players to control the length of the game to a certain degree. For the younger and less experienced players, this game variant removes the Hired Hands from the game. Not that the cards are terribly difficult, but they do add an additional level of complexity that might be off-putting for those who easily get exasperated or cannot read well. If a Hired Hand card is rolled, it’s treated as a “wild”, allowing the player to take any Food token of their choice from the Food pool. This game variant pits 2 players against another 2 players in a head-to-head battle. Well, not battle. In truth, it’s a cooperative ranching adventure. And by “adventure”, I mean “venture”, as in risky business dealings. Two players act as a team and attempt to beat the other team by assisting each other to create the best Dinosaur Ranch this side of the Mississippi. 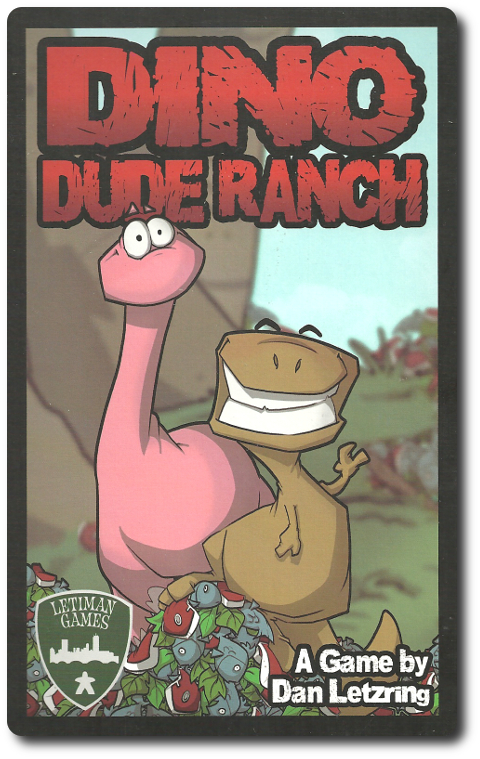 To learn more about Dino Dude Ranch, visit the game’s web page. The Child Geeks really enjoyed themselves, with the one exception being the dice that occasionally didn’t roll what was needed. That and the Hired Hand cards tended to make the Child Geeks groan. According to one such Child Geek, “When things go well, this is a fun game. When opponents start to mess with you or the dice won’t stop rolling leaves, things stink.” Which is pretty much like any other game. When a resource is made available based on random outcomes, it can be difficult to make plans. As one Child Geek put it, “In this game, you just have to roll with the punches.” Despite the Child Geeks being less than pleased at times with the outcome of their turn, all of them voted to approve the game, finding Dino Dude Ranch to be fast, fun, challenging, and rewarding. The Parent Geeks enjoyed the game, as well, but found they appreciated it more with their family and children rather than with their peers. 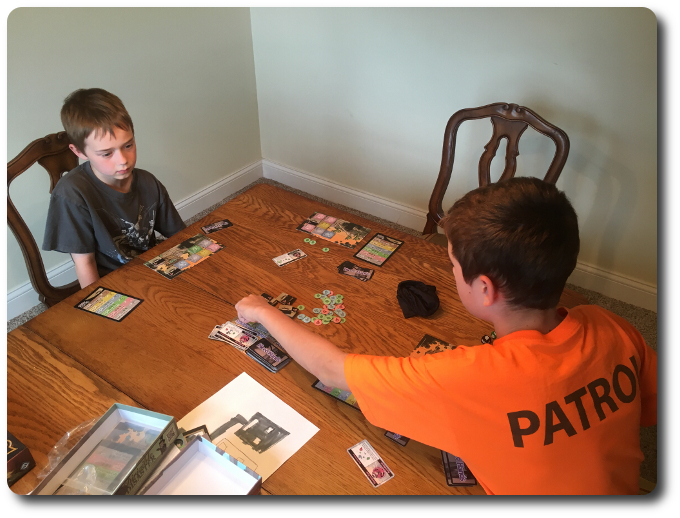 According to one Parent Geek, “The game is great, easy to learn, and challenges you just enough to keep you interested. Great for the family, but I think it is too simple for just adults.” Another Parent Geek, a non-gamer, said “I’ve never played a game like this. I’m having so much fun!” What it came down to was previous gaming experience. Those Parent Geeks who had played many games appreciated Dino Dude Ranch, but stopped short of saying it was a game for adults or skilled players. The non-gamer and less experience Parent Geeks told me to forget that noise and approve Dino Dude Ranch with as much gusto as possible. The end result was a mixed level of approval. The Gamer Geeks gave the game full marks for its design and solid rules. According to one Gamer Geek, “This is the kind of game I wish I had around as a kid. It makes you think, engages you, and challenges you.” Another Gamer Geek said, “Great kids game. Not for adults, but great for kids.” The Gamer Geeks didn’t think Dino Dude Ranch had enough depth, strategy, or tactics to be a game of much interest to them. They especially didn’t like that resources were randomly distributed, although a number of the Gamer Geeks said other games they enjoyed (for example, Catan) did the same thing. Still, they found the game to be a good one with the only fault being it was a game that didn’t have gaming elitists in mind. The Gamer Geeks rejected Dino Dude Ranch, but noted they would gladly recommend it to their children. The entire time I was playing the game, I kept thinking I had played it before. It dawned on me later that my experience with Zooloretto and Zooloretto Mini was similar, but not identical. Thus the feeling of familiarity I had the entire time I was playing Dino Dude Ranch. The game makes use of different and common gaming mechanics that make it easy to learn and play. The game, although borrowing from other rules and game play, has a distinct feel of its own. While not overly unique, you won’t care. It’s true that the game is simple, but it’s not simple to win. Players must balance a bit of risk and reward, buying dinosaurs or holding off in hopes of buying later or buying something different. The real risk is another opponent finishing the game before you. 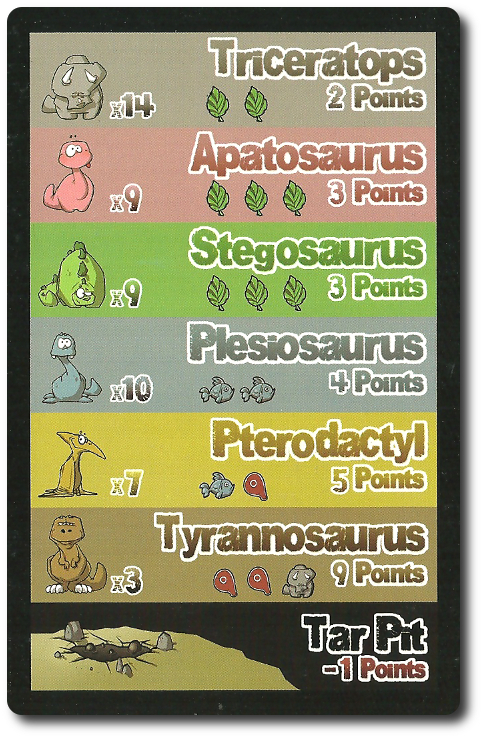 You can win this game by buying the least expensive dinosaurs and filling up your board before others, thus skunking opponents. Players must also do what they can to leverage their special Hired Hand abilities and bonus scoring that is unique to them. Overall, I am most pleased with the game. While I would not care to play it with my Gamer Geek friends, I wouldn’t hesitate to bring it to the table with my family or with a mixed group of players with different skills and backgrounds. Well worth the time for those who normally can’t get a game to the table that everyone would enjoy. While the dinosaurs in the game are extinct, the thrill of capturing giant lizards lives on in Dino Dude Ranch. Do try it when time permits. Tagged Child Geek Approved, Children's Games, Prehistoric Games. Bookmark the permalink.